My daughter and I have made these pork chops numerous times and they are very good every time. Heat butter and oil in a 12-inch skillet over low heat. 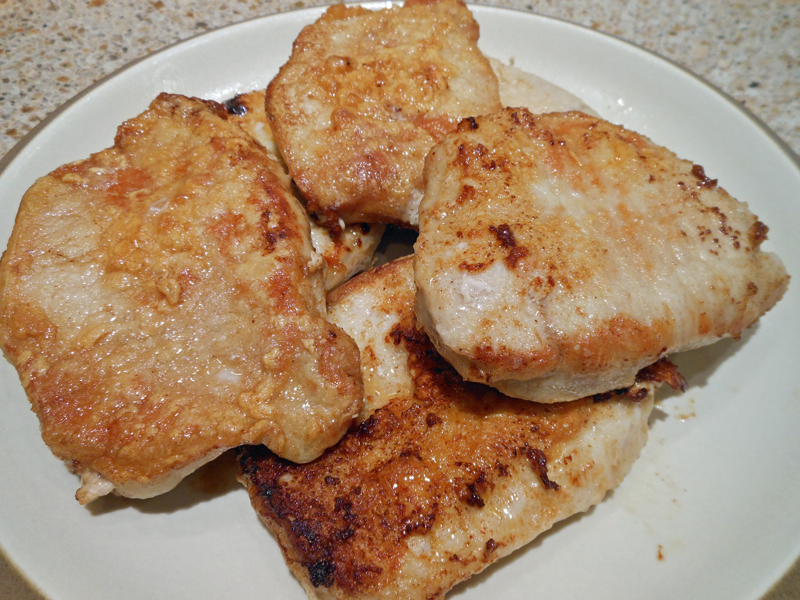 While pan is heating, sprinkle chops on both sides with salt and pepper, then dredge in flour. A couple of minutes before sauteing, increase heat to medium-high. When the butter stops foaming and starts to smell nutty brown, arrange chops in the skillet. Cook, turning only once, until they are a rich golden brown, about 3 minutes per side. Remove from skillet. Make a pan sauce by adding 1/2 cup liquid (chicken broth, water, wine) to the skillet; boil until the liquid is reduced to about 1/4 cup. Whisk in 1 tablespoon butter or 2 tablespoons heavy cream until sauce is smooth and glossy. Spoon a portion of sauce over each chop and serve immediately.